Photo by Dave Alexander, Mike Bellino's Hair by Clifton Davis. This gallery contains several buzzcut haircuts for guys looking for a short haircut. To make sure you get exactly the haircut you're looking for, I recommend printing a photo of the style and taking it with you. 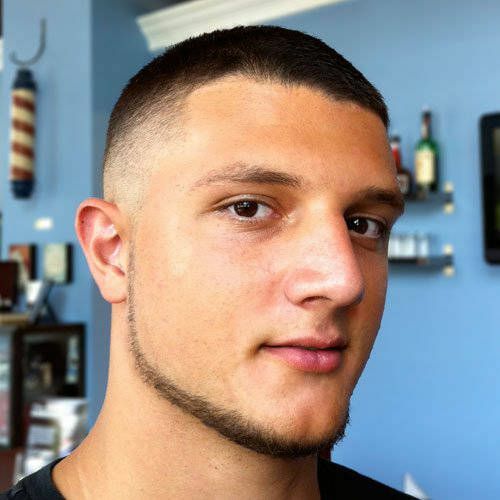 Mike Bellino sports a bald fade haircut done with a number 3 blade on top and faded to skin on the sides and back. He also sports a short, chin strap beard which conforms to the shape of his jawline. Photo © TomFullum | iStockphoto.com. This is your basic buzzcut done with a number 2 guard all over the head. Very simple. Rick Malambri sports a simple buzzcut done with a number two blade all over. The ultimate wash and go style. Photo © Astrid Stawiarz | Getty Images. Mike Posner looks Cooler Than Me with his short buzzcut and neatly trimmed beard. Photo © Alberto E. Rodriguez. Jessie Metcalf is wearing a buzzed style done with a number 1 blade on the sides and back and a number 4 blade on top. Photo © Linleo | Dreamstime.com. This is a short buzzcut done with a number 1 1/2 blade. Photo © Chantal Ringuette | Dreamstime.com. This somewhat scruffy buzzcut was done with a number 3 guard all over the head. Photo © Timothy White | Turner Network Television. Dark Blue's Logan Marshall Green sports a buzzcut done with a number 2 blade on top and faded to a number 1 blade on the sides and back.